A few years ago, we were lucky enough to be gifted a beautiful Akane apple tree. 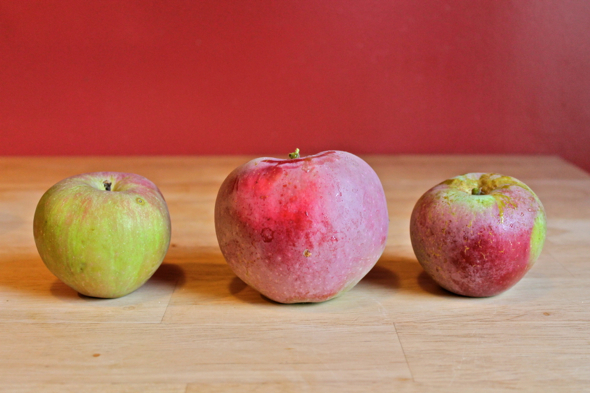 Akanes are a fantastic type of apple—sharp, only lightly sweet, and boasting a fantastic crunch. Last year we ended up giving a great deal of our tree’s apple harvest to our son’s school, but this year we will be in charge of eating these crisp little fellows on our own. I have no complaints about this. Akane apples are great when plucked from the tree and eaten straight away, but they are also superb for baking. Their less-sweet flavor lends itself well to being folded into baked goods, and their firm flesh is a champ at holding its shape and resisting the urge to melt into mush when exposed to hot temperatures. Which makes me wonder: When did the pumpkin become the official food of autumn? It seems as though the mere mention of autumn will unleash the squash recipes with full force. Summer is barely over, and yet it is impossible to walk down the street from my house without seeing coffeehouse after coffeehouse after bakery practically screaming the virtues of pumpkin. Pumpkin bread is mighty fine, I admit, but what about the other fruits of the season? Have we forgotten about the apples and pears? Truthfully, I think I do actually understand the tendency to learn towards pumpkins when autumn makes its first appearance. Due to the fact that one is able to make year-round purchases of apples and pears at the grocery store, the pumpkin harvest is a more notable signifier of the arrival of a new season. Pumpkins signal something, whereas apples, well, apples just mean apples. Not that they have to. Those apples you’re getting at the market in June are nothing compared to the apples that first start showing up in September and October. June apples have been sitting in storage for months, ever since the previous year’s harvest ended, but September apples have only just barely been freed from their trees. Like warm June strawberries plucked fresh from a backyard patch, fresh September apples are a revelation in apple-eating. However, if you’re like me and you did not manage to treat your apple tree in time to ward off spring’s deluge of codling moths (note: I treat my apple tree with an organic insecticide called Spinosad, which is unfailingly effective if you treat the tree before the moths arrive to lay their eggs, which I, unfortunately, was not able to do), sometimes you have to do a bit of slicing and dicing in order to enjoy your homegrown apples. 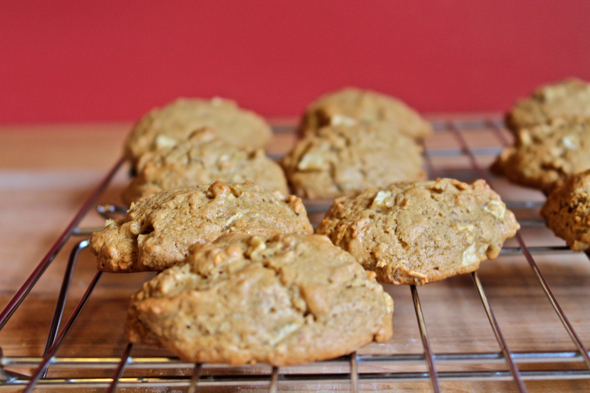 A cookie like this, with bursts of apple and the heartiness of oats and whole wheat flour, is the perfect welcome mat for autumn’s new fruit. 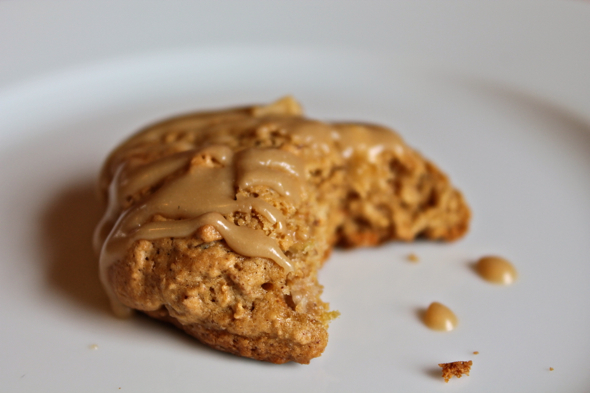 Drizzled with a slip of caramel-tinged penuche frosting, it tastes like the arrival of autumn, all wrapped up in a tidy cookie package. Spread oats in a single layer on a large baking sheet, then toast in the oven until the oats are golden brown, about 8 to 10 minutes. 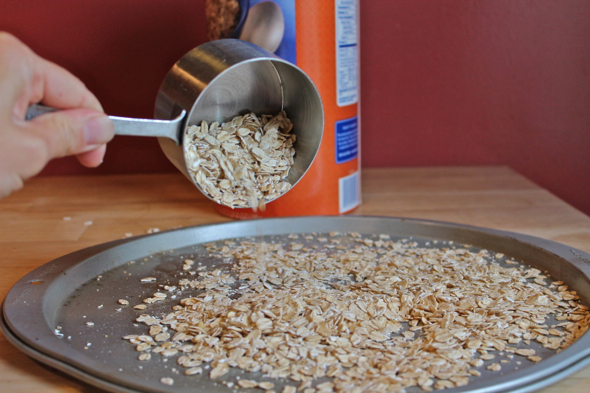 Remove oats from baking sheet and set aside to cool. In a large bowl, combine brown sugar and butter and beat until light and fluffy, about 3 to 4 minutes on high speed. 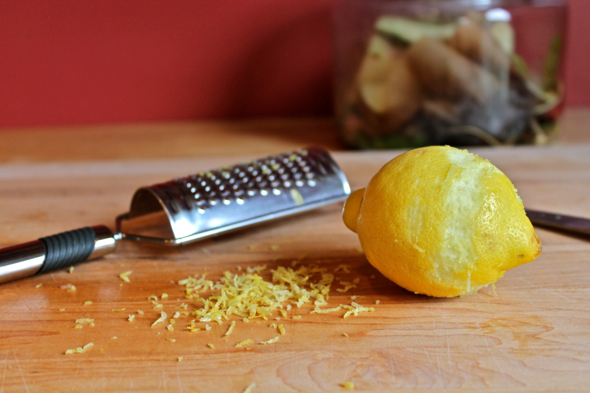 Add milk, lemon juice, lemon zest, egg, and vanilla, and beat until combined. 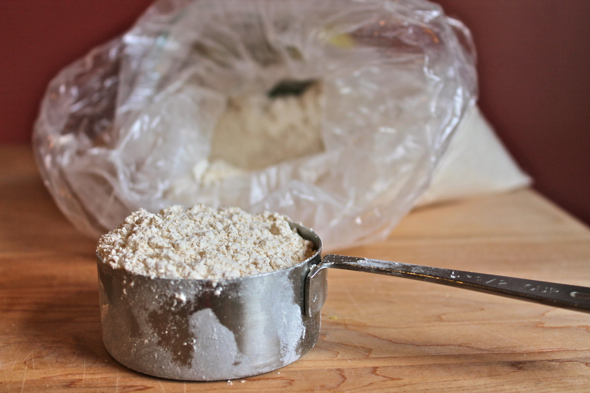 Add toasted oats, all-purpose flour, whole wheat pastry flour, baking soda, spices, and salt, then mix well on low speed. 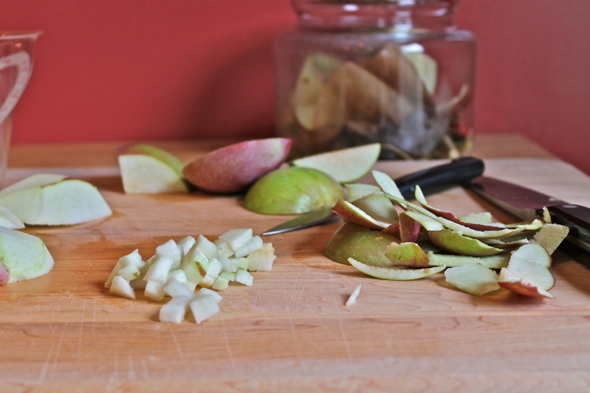 Stir in chopped apple. Drop dough by rounded tablespoon-fuls, spaced about 2 inches apart, onto a parchment-lined baking sheet. Bake cookies in center of oven until lightly golden, about 10 to 13 minutes. To ensure even baking, only bake 1 sheet of cookies at a time. Remove to a wire rack to cool. 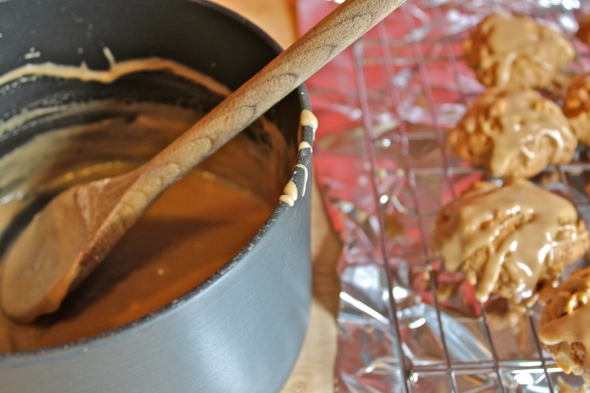 While cookies are cooling, make penuche frosting by combining butter and dark brown sugar in a medium saucepan. Over medium heat, stir to combine the two, allowing mixture to come to a light boil. Boil for 1 minute, stirring constantly, until mixture has thickened slightly. Remove from heat and set aside to cool slightly. After mixture has cooled for about 10 minutes, add milk and beat until smooth, then add powdered sugar and beat until mixture is smooth and combined. 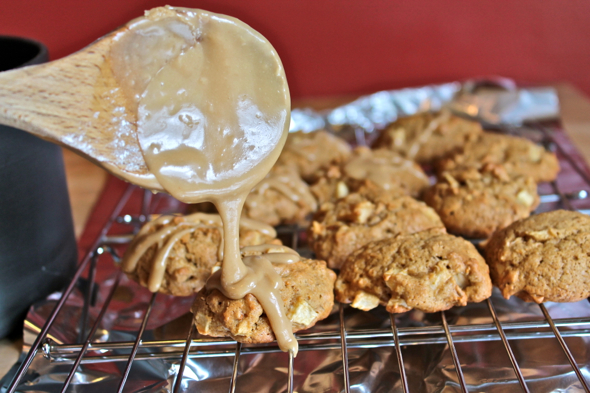 Using a large spoon, drizzle cooled cookies with penuche frosting. Makes about 3 dozen cookies, depending on how generously the tablespoon-fuls of dough were portioned out. 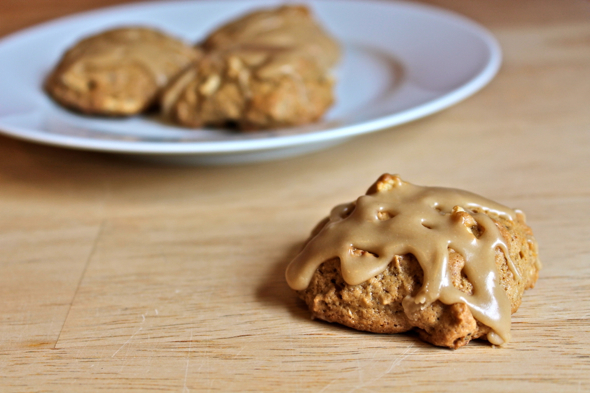 These cookies sound like a holiday in my mouth! 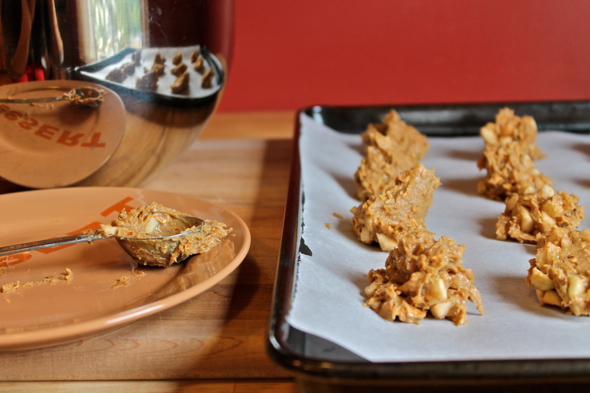 I love the combination of ingredients, and then….the Penuche topping. Wonderful, and I must try soon.